Anyone who has a cat for a pet knows how much fun they can be. They can be a problem, too. You have to keep them fed and watered, clean out their boxes, brush them to remove shedded fur and danders, and sometimes have to remove them from places they should not be. But what if you want to have a cat for a pet, but cannot have one because your landlord does not permit pets, or someone living with you has an allergy to pets. 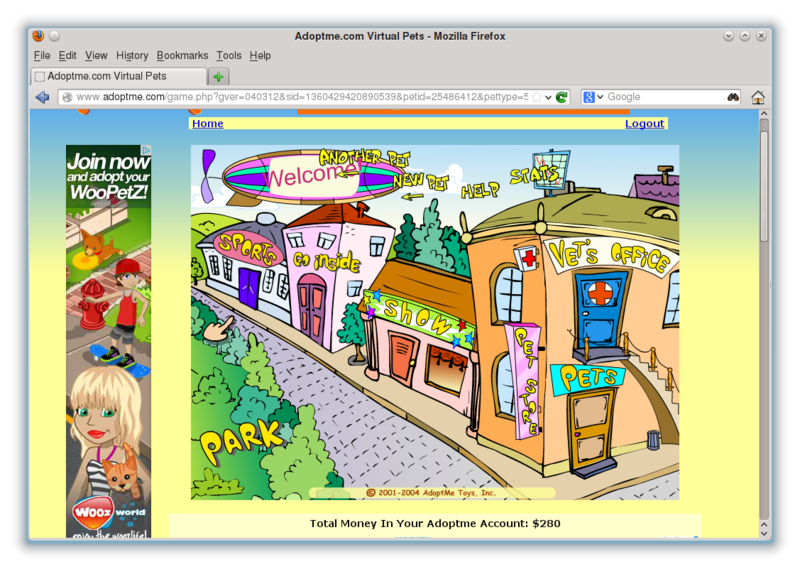 If you cannot have an actual cat for a pet, but really want to have a cat, then why not adopt a virtual cat? 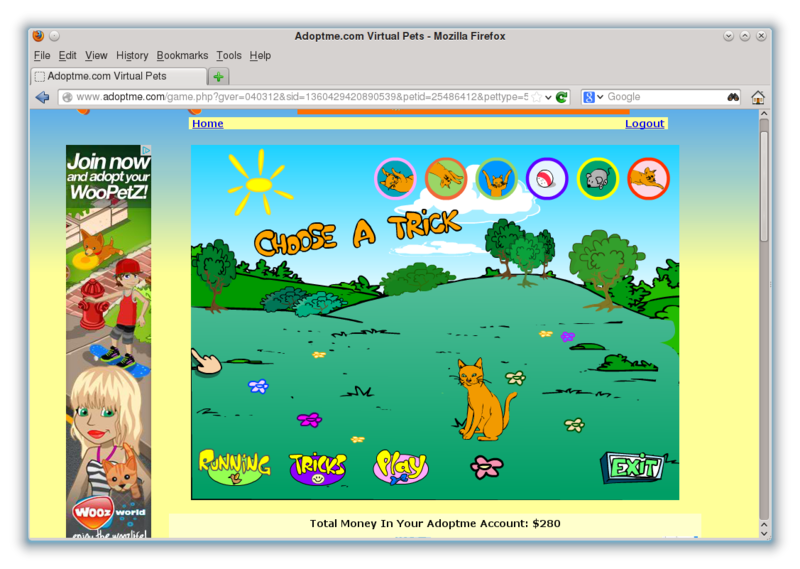 AdoptMe.com is a site that allows you to adopt virtual pets such as cats, dogs, horses, and fish. AdoptMe was a series of stuffed toys that were available at Kohl's during the 2006 holiday season. (Other retailers sold the toys, but this is where I first came across them.) These toys came with serial numbers so you can "register" these pets with AdoptMe.com. The idea behind these toys is to teach the basic responsibilities of pet ownership to children. 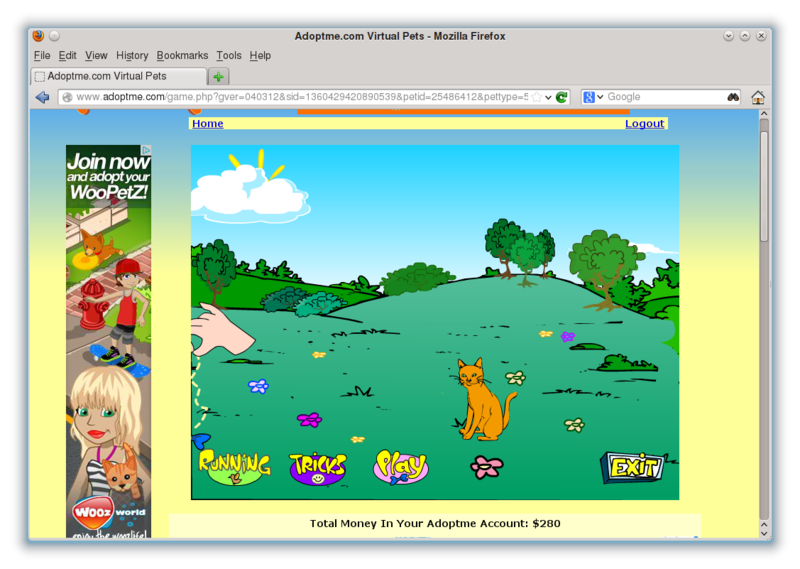 When you want to adopt a virtual pet for the first time, you will need to click on Adopt a Pet. You do not need an account to adopt pets, but it is a good idea to have one. 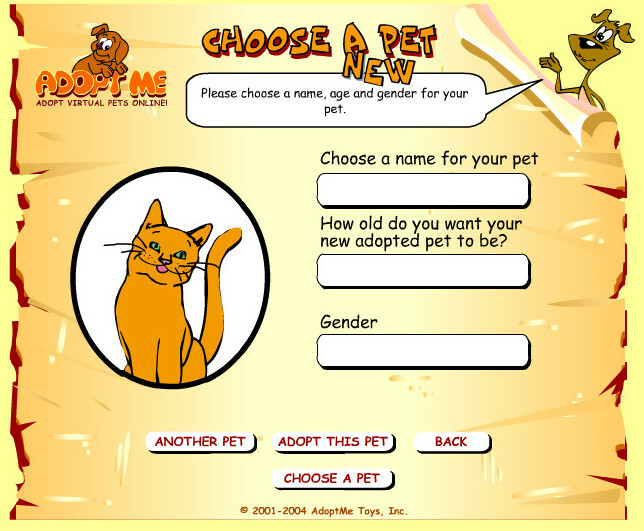 After clicking on Adopt a Pet, you will need to come up with a username and a password for this account. You will need to enter the password twice to confirm and to check spelling of the password. You will also need to enter your e-mail address so if you forget your password, AdoptMe.com will send you the needed information. The age field is for demographic purposes only. 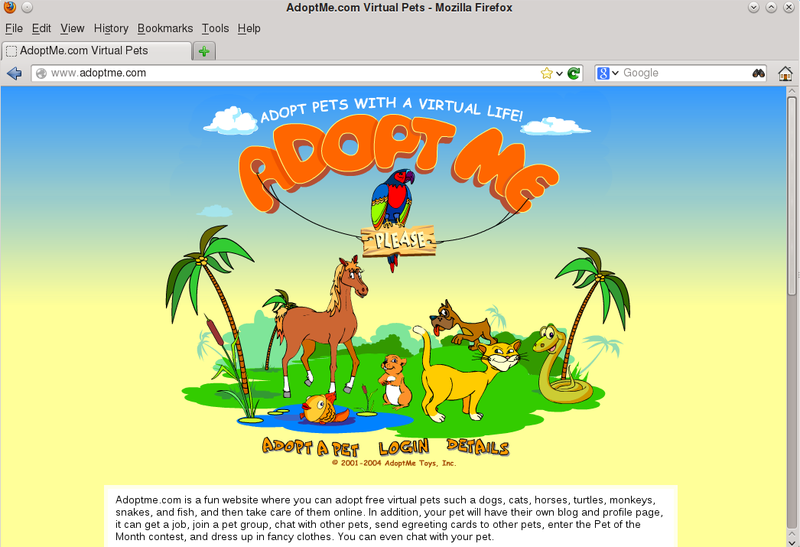 Alternately, you can use the Guest Login page (http://www.adoptme.com/guestlogin.php) to adopt a pet without having to register for a user account. 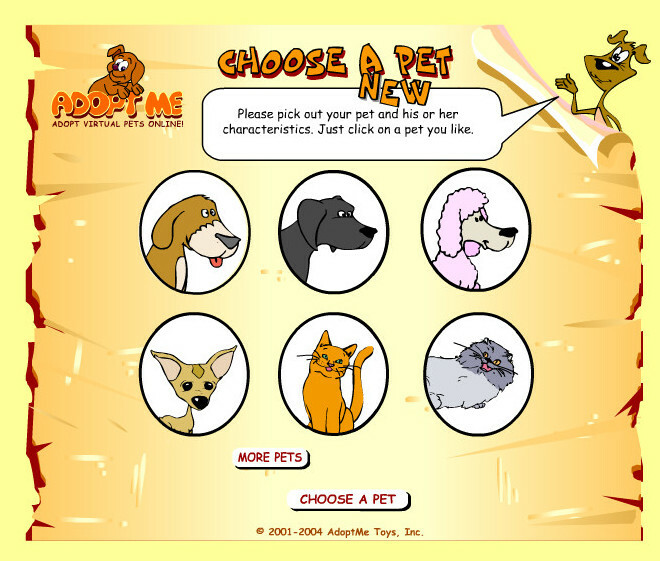 Only six pets are shown at one time. Click on More Pets to scroll to the next page. 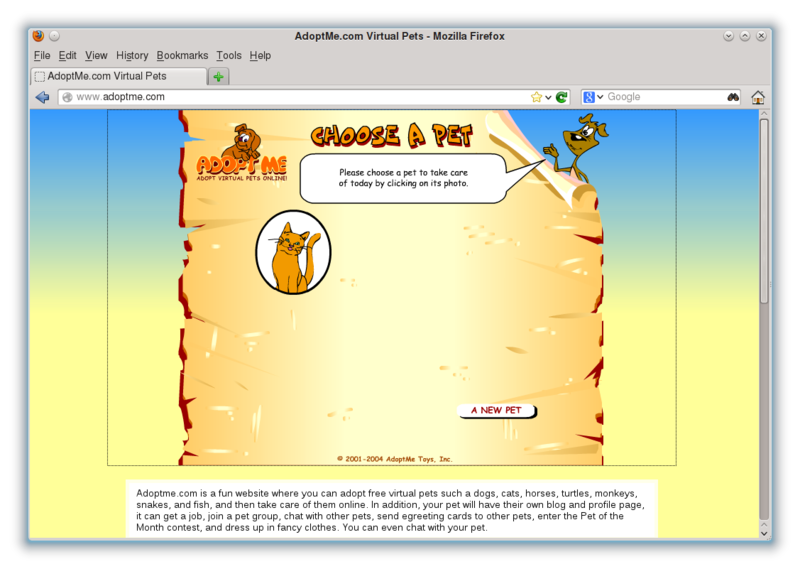 For virtual cats, you get to choose from European Tabby, Persian, Scottishfold, and Siamese. For this article, I chose a European Tabby. Here, you give your virtual cat a name, the age in years, and its gender. For my account, I have a one year old male tabby named Thomas. If you use the register login screen, your AdoptMe account will be created. Otherwise, your username will begin with Guest followed by a series of numbers. I have chosen to register for a AdoptMe account. 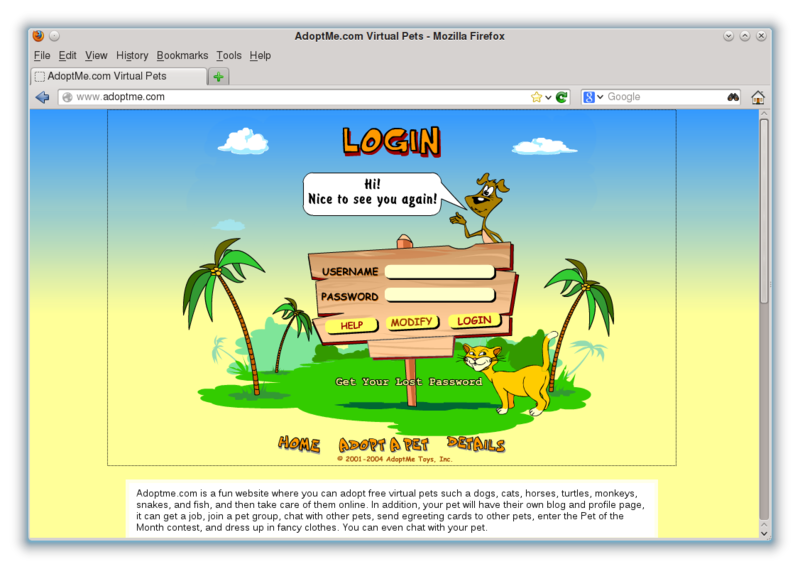 For subsequent logins, you will need to click on Login at AdoptMe.com: Enter your username and password, and click on Login. Clicking on Modify will allow you to change your username or password. After logging in, select the pet you wish to work with by clicking on the pet's picture, or you can adopt a new pet by clicking on New Pet. ...and this is the main screen where everything happens in the simulation. 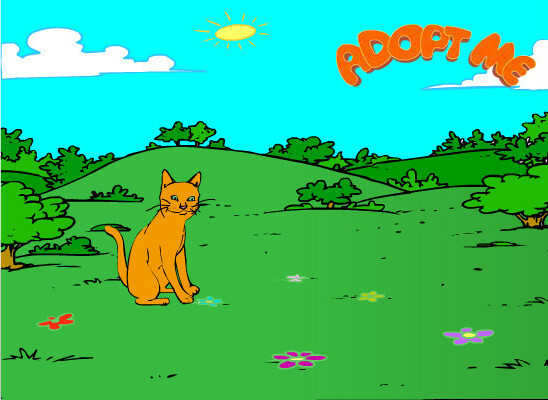 You can adopt a new pet from here by clicking on New Pet. Clicking on Another Pet will take you back to the Choose a Pet screen where you can select another virtual pet to take care of. Help opens a balloon containing the user manual for the simulation. Stats shows you in a chart what is happening with the simulation. The Stats screen is very helpful in tracking progress on how you are doing with your pet. Special messages appear at the top of this screen. In this example, Thomas needs a trip to the veterinarian's office. 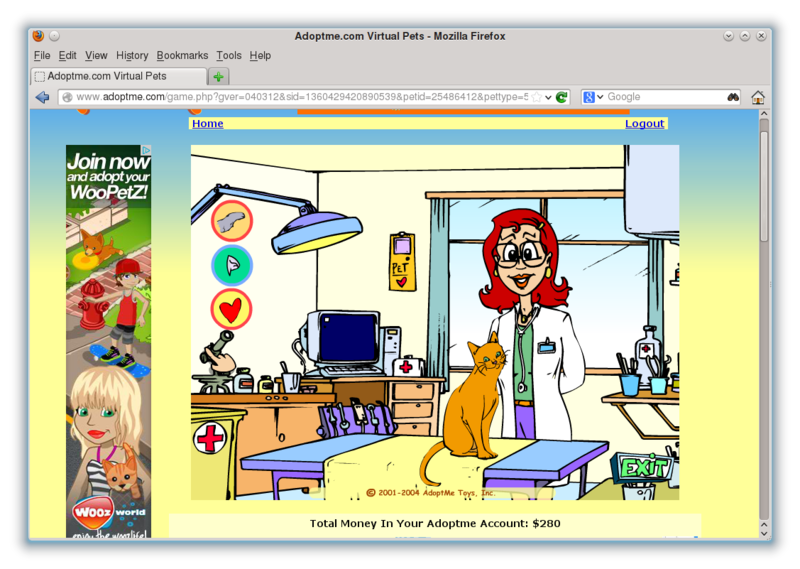 In this simulation, all pets need to go to the vet every three days, and each trip to the vet costs $40.00. This example screen shot was taken on February 9, 2013. Each item in the stats screen is accompanied by a color patch. Here, Thomas is in good shape as all stats are showing green. When you first get your pet, this level is set to 50. Take care of your pet, and this number will rise. The bar is fully colored once you reach a level of 100. As of this writing, Thomas has a happiness level of 210. 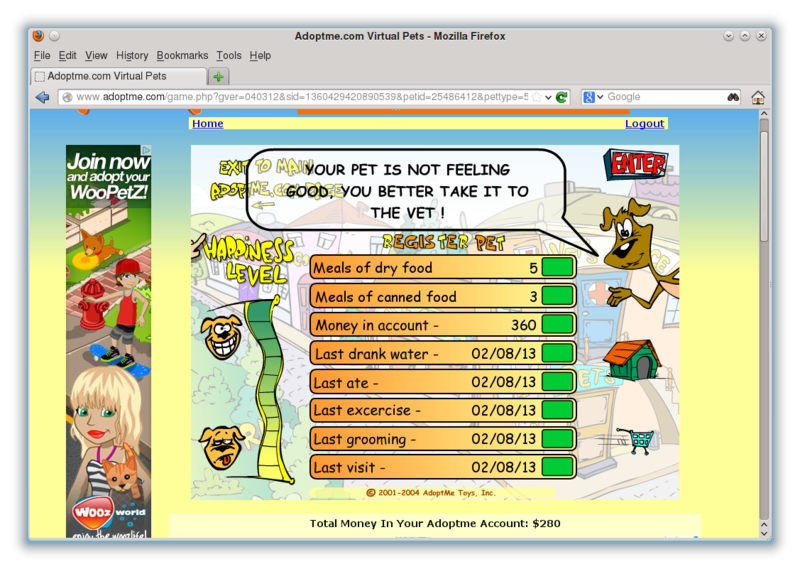 The shopping cart pulls up a list of items you have purchased for your pet (excluding food). The kennel has a special purpose. As with real cats, you can board your pet in the kennel when you are going away for some time (such as a vacation). For $3.00 per day, your virtual cat will be fed, taken to the park, watered, and cleaned daily. It is well worth the cost and if you neglect your cat, you will know about it when you log back in. 1. Have at least three servings of dry cat food and three servings of canned food available. 2. Make sure your cat gets fed and watered at least once a day. 3. Make sure your cat gets groomed at least once a day. 4. Make sure your cat gets some exercise at least once a day. 5. Take your cat to the vet the same day a message indicating your cat is sick appears in the Stats page. This should happen once every three days. Most importantly, check the amount of virtual money you have to work with. 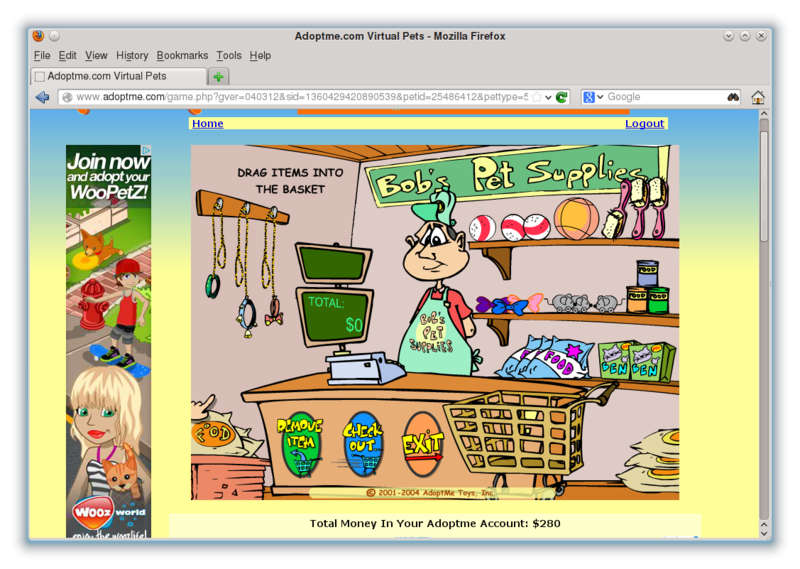 Virtual money is what you use in the simulation to purchase supplies for your virtual cat. When you adopt your first virtual cat, you get $210.00 in virtual money to work with. You get $80.00 added to your account at the start of each day (the first time you login for that day). 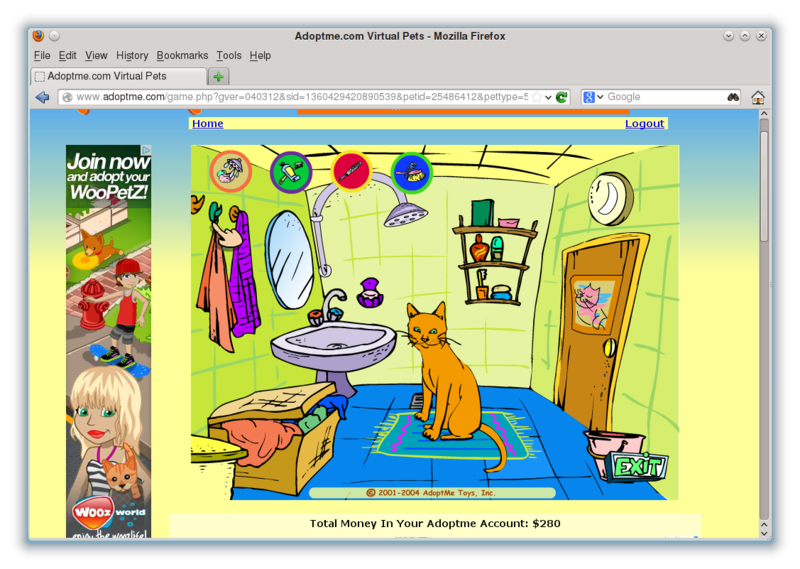 When you adopt additional virtual cats, you get $100.00 added to your account for each cat adopted. Unlike the real world, you can get a job for your cat to earn additional money (when jobs become available). There are some circumstances where you can earn additional money such as achieving a happiness level of 200, where you get an additional $80.00! Pet Toys. You will need to get at least one bow for use in the park. You can purchase toy mice and balls in the shop, but they are not needed as they are already provided in the gym and in the park. Collar. As in the real world, collars are optional, but they are worth the expense, especially if you want to keep your cat happy. Brush. This is a mandatory item for grooming your cat, which happens in the bathroom. You will not be able to groom your cat without this. Most activities in the simulation cost nothing and should be done at least once a day. 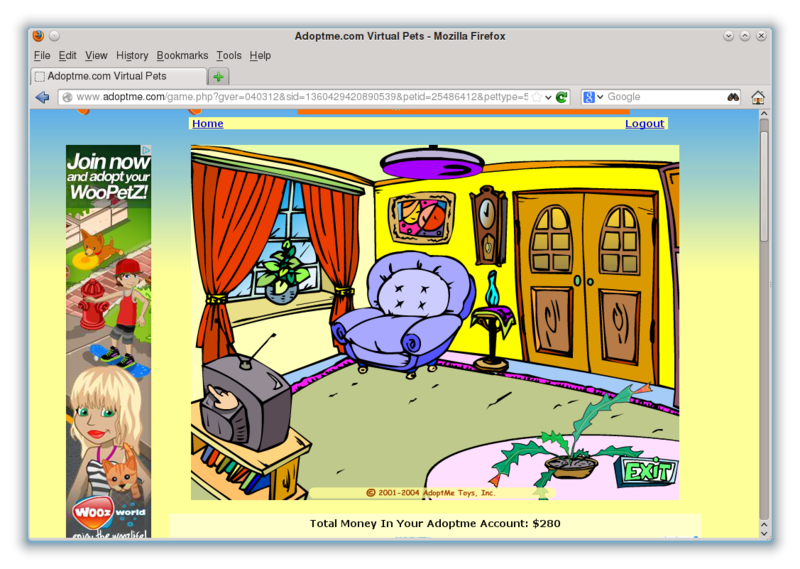 Keep in mind that before you decide to adopt another cat, be sure you can sustain enough money in your account to support all of your virtual cats. On the left side of this screen, there are three buttons. Each of these buttons represents an activity performed by the veterinarian. To make your cat feel better, you must click on all three buttons top to bottom. After you have done that, click on Exit. You must visit the vet when the simulation tells you to keep your cat happy. Keeping your cat happy is very important to the success of this simulation. When you start this simulation with your first cat, the happiness level will be at 50. You need to be sure your cat has been fed, groomed, exercised, and is feeling well in general. If you do this on a daily basis, your cat will achieve great levels of happiness. The Stats page shows how happy your cat is on the left hand side. The level will be fully covered when the happiness level of your cat reaches at least 100. On the other hand, if you do not take care of your cat, expect problems when you login as your cat's happiness level will drop. When you login to AdoptMe.com, your cat will be found in your home, namely the bedroom. To get there from the main screen, click on the door below where it says Go Inside. The interior of your virtual home will be shown. First thing to do is go into the bedroom. Your cat may or may not be asleep. If your cat is not asleep, there will be five buttons representing activities your cat can do in the bedroom. To complete the tasks in most any room, you need to click on the button representing each activity at least once in the order shown. In the real world, we really do not want your cat to use your pillow as a scratch pad. In this simulation, nothing gets damaged, unless your cat is quite unhappy (the happiness level drops below 50). When finished, click on Exit to get back to the interior screen. There are four buttons representing activities needed to groom your cat. Click on all four buttons in the following order to complete the task. Of course, the cat needs to be in the bathroom for anything to happen. Shower. Click on this first to wash your cat in the shower. In real life, cats generally tend to clean themselves and do not require placement in a bathtub. But then, there are the exceptions. Teeth Brushing. Click on this second so your cat will brush his/her teeth. Of course, this cannot happen with a real cat. Nail Filing. Click on this third so your cat will file his/her nails. In real life, this is what scratch pads are for. Brushing. Finally, click on this button to brush your cat's fur. If you have not purchased a brush, the fourth activity button will be crossed out. You will need to purchase a grooming brush from the pet store before re-entering the Bathroom. In real life, this is the only step needed to groom your cat. It is very important that your virtual cat be fed and watered on a daily basis. Water is provided with the simulation. 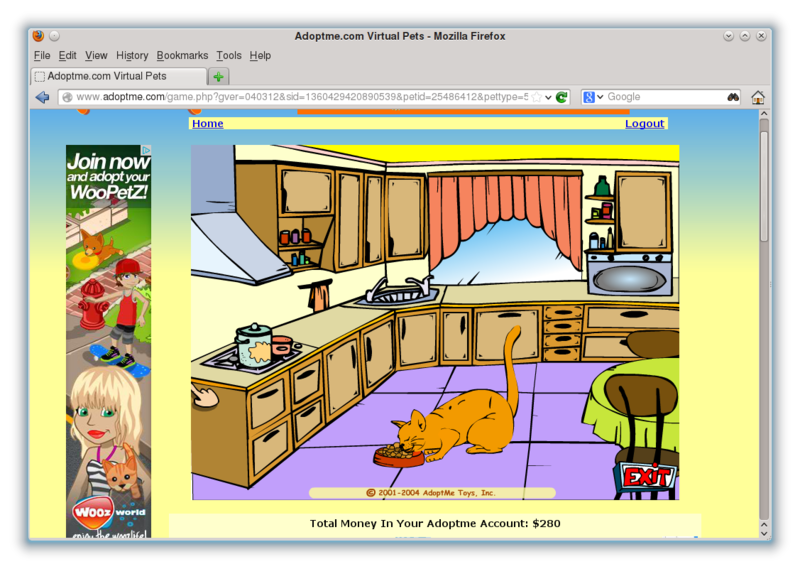 You must purchase cat food (in some form) from the pet store in order to be able to feed your virtual cat. Check the Stats screen to see how much dry and canned food you have available (in terms of servings). From the interior screen, there are two links below the word Kitchen, named Drink and Eat. These links take you to the kitchen, where your cat is sitting by the bowl on the floor. If you click on Drink, there is water in the dish. If you click on Eat, there is food in the dish. Once you enter the kitchen, click on the bowl to feed or water your cat. Once your cat is done, click on Exit to return to the interior screen. You need to enter the Kitchen twice. Once to feed the cat, and once to water the cat. Both tasks cannot be accomplished with one visit to the kitchen. If you clicked on Eat, one serving is deducted from either the canned food supply or the dry food supply. Which supply is used is randomly chosen. Be sure to check the Stats screen to see how many servings of each type of food are available. You may need to go to the pet store to purchase more food. Every cat needs some recreation. To go to the park, you will need to be sure you are in the main screen. If you are in the Interior screen, click on Exit to get to the main screen. Alternately, you can click on Home on the toolbar above the simulation screen on the displayed page. Click on Park to enter the park. You will need to purchase a bow from the pet store to be able to complete the task here. Otherwise, the Play Button on the Park screen will be crossed out, and you will never be able to complete this task. When you enter the Park screen, the mouse pointer will show a bird. This allows your cat to run throughout the park. Move your mouse pointer around the play area. You will see your cat run around the park chasing the bird. After a minute or so, click on Tricks. There is a row of buttons that allow your cat to perform six tricks in the park. This is similar to what we have done in the bedroom. To successfully complete this task, you must click on each of the buttons from left to right, allowing the animation to play for each task. Rollover. Your cat will roll over on his/her back. Flip. Your cat will do a back flip. Dance. Your cat will dance the same as in the bedroom. Ball. Your cat will bounce the ball once and then toss the ball off the screen. Balls are provided in the park so you do not have to purchase any from the pet store. Mouse. Your cat will play with a toy mouse. Mice are provided by the park. Stalking. Your cat will crawl around as if to hunt down mice and other prey. Once your cat performs all six tricks, click on Play to play with the bow dangling off a string. You must have purchased a bow from the pet store to perform this task. 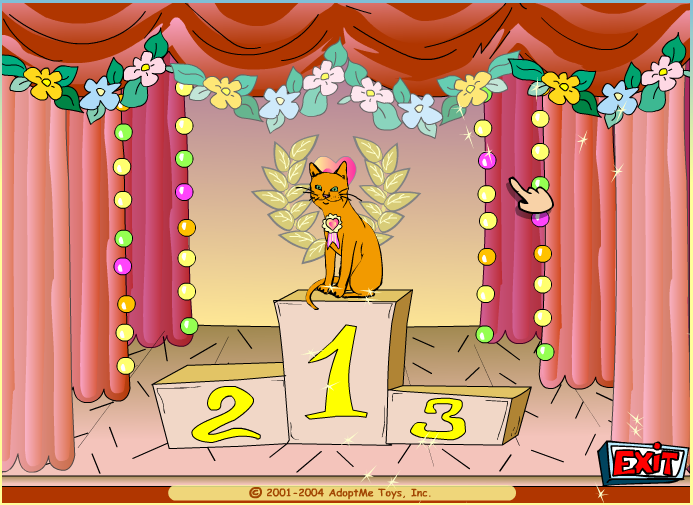 Move the mouse pointer around (it is a hand with the bow dangling from a string) and click on the play area for your cat to chase down the bow. Continue this until your cat meows. At that time, your tasks in the park are finished. Click on Exit to return to the main screen. To enter the Gym, go the the main screen and click on the door underneath the word Sports. This will take you to the gym screen. There are four activities your cat can perform for exercise. Click on all four (at least once) and watch the animations. Your cat can swing on the grips, climb the rope, bounce a basketball and ride the exercise cycle. Click on Exit to get back to the main screen. 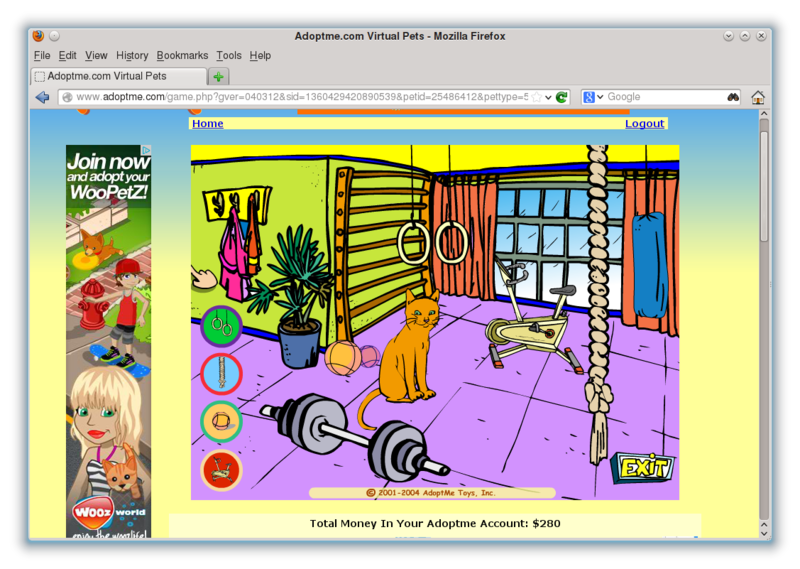 What I have just shown you is a basic routine you should perform daily for your virtual cat. 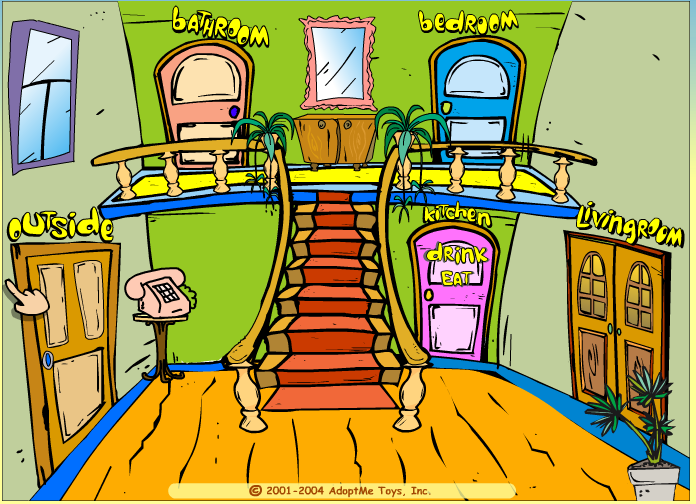 To finish with your cat, go into the Interior Room (the one labelled Go Inside), then click on Bedroom. This will allow your cat to nap until you are ready for your next session. Click on Exit to get back to the Interior screen. Now click on Living Room. If your cat is happy, this is what your living room should look like. If not (the happiness level is 50 or below, your cat will appear in the living room raving mad, with the living room being very messy, and furnishings damaged. On the day of your cat's birthday, the living room will be decorated for your cat's birthday. AdoptMe has special features that go beyond the basics of pet care. AdoptMe comes with places to visit and games to play. Your pet can join clubs, chat and blog about his/her experiences. Also, you can dress up your cat with accessories (if you wish). The menu appears below the play area. Click on View <pet's name> Blog to view your virtual cat's blog. It is a good idea to read this blog as it shows your progress in how you take care of your pet. 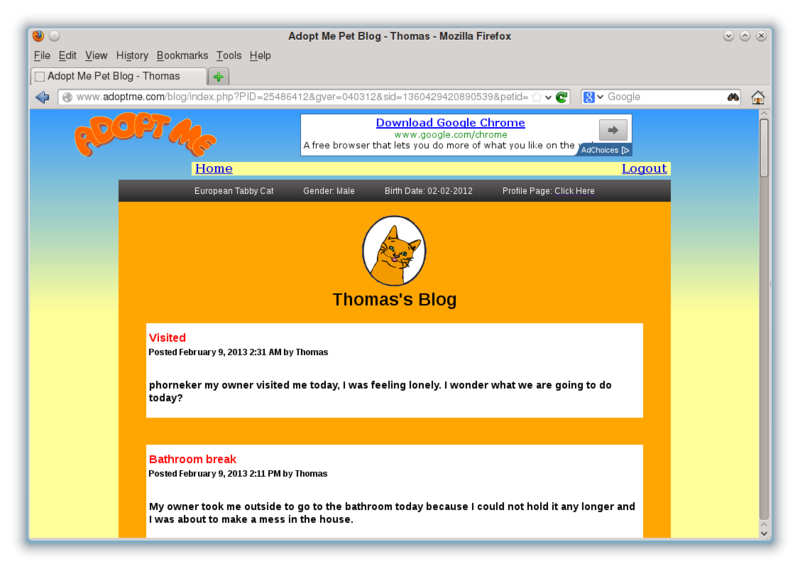 You can also read other pet's blogs too. Also, from the main screen is a item called Show. Here, your cat is placed into a cat show, and if there is a show going on, your cat will be in first, second or third place depending on how well you took care of your cat. It costs $25.00 to enter your cat into the cat show. 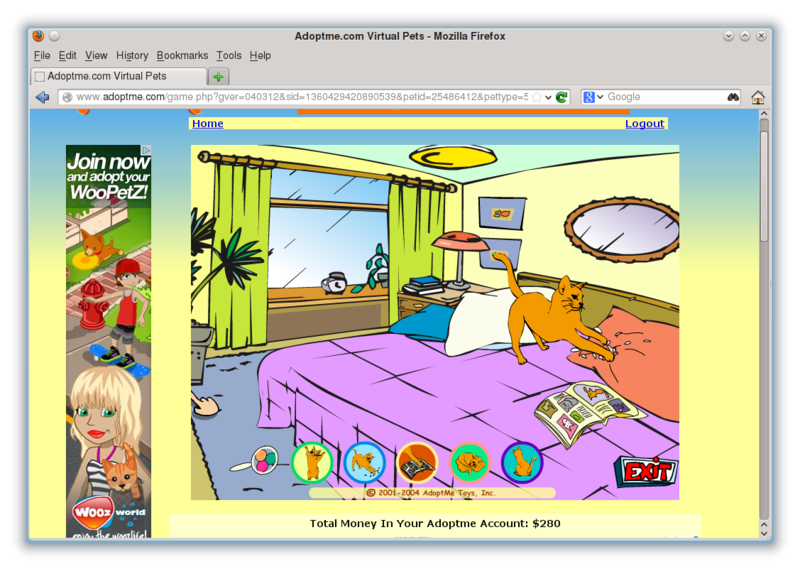 A virtual cat is no real substitute for adoption of a real cat. However, if you really want to adopt a cat, but circumstances prevent you from doing so, such as living in a place where pets are not allowed, or someone in your household has a strong allergy to pets, a virtual cat may be your only option. Even if you do adopt a real cat, having a virtual cat provides you with all the benefits of cat ownership, and very few of the problems associated with cat ownership, provided that you take proper care of the cat. Copyright (c) 2013, The PCLinuxOS Magazine. All Rights Reserved.